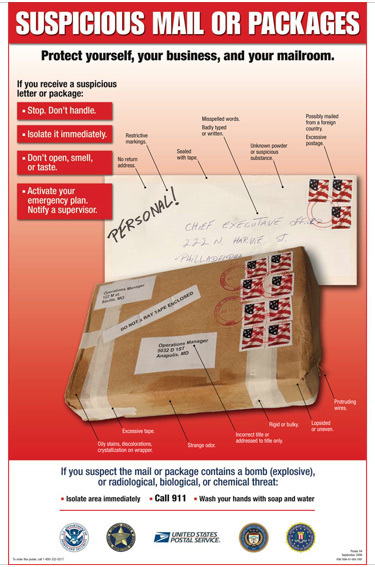 t is important for you to prepare and know how to identify a suspicious package and what you can do to stay safe. Look at the handwriting. Suspicious packages are often addressed by hand in all capital letters, or with cut-and-paste lettering. Pay attention to the return address. Suspicious packages often do not have a return address, or they may be postmarked from a city that does not match the return address. Note the postage. A package with excessive postage (more than was necessary for a package to reach its destination) should be treated as suspicious. Sometimes suspicious packages are delivered with no postage. Wrapping matters. If a package is unprofessionally wrapped with excessive packing material such as tape and/or string it should be treated as suspicious. It may also be labeled with restrictive endorsements – Fragile: Handle with Care, Rush: Do Note Delay, Personal, Confidential, or Do Not X-Ray. Use your senses. Be aware if the package has an unknown liquid or powder seeping through the wrapping or a strange odor. Do NOT sniff, taste, or touch the package or ask others to do the same. Hands off. Do not open the item or shake or empty the contents. Keep your distance. If you think you are dealing with a suspicious package, leave the room and close the door behind you. It is important to section off or isolate the package so other people do not enter the area. Don’t run away. Leaving the area could potentially spread dangerous or deadly materials to other locations, including your home. The authorities will determine if you need to undergo decontamination, medical treatment, or simply monitoring for any side-effects. Call 9-1-1. Use a land line to call 9-1-1. Do not use a cell phone or device that sends a signal because it could trigger an explosive device. Stay calm. Listen to your intuition and do not worry about embarrassment if you are wrong about a package being suspicious. It is always better to be safe than sorry. Clinical benefit is greatest when antiviral treatment is administered as early as possible after illness onset. Therefore, antiviral treatment should be started as soon as possible after illness onset and should not be delayed even for a few hours to wait for the results of testing. Ideally, treatment should be initiated within 48 hours of symptom onset. However, antiviral treatment initiated later than 48 hours after illness onset can still be beneficial for some patients. A very large observational study of more than 29,000 hospitalized influenza patients reported that while the greatest clinical benefit was found when antiviral treatment was initiated within 48 hours of illness onset, starting antiviral treatment more than 2 days after onset had survival benefit in adults versus no treatment. 6 Also, a randomized, placebo-controlled study suggested clinical benefit when oseltamivir was initiated 72 hours after illness onset among febrile children with uncomplicated influenza.7 Clinical judgment, on the basis of the patient’s disease severity and progression, age, underlying medical conditions, likelihood of influenza, and time since onset of symptoms, is important when making antiviral treatment decisions for outpatients, particularly those who are not at increased risk for influenza complications. Because of the importance of early treatment, decisions about starting antiviral treatment should not wait for laboratory confirmation of influenza. Therefore, empiric antiviral treatment should generally be initiated as soon as possible when there is known influenza activity in the community. A history of current season influenza vaccination does not exclude a diagnosis of influenza in an ill child or adult. During influenza season especially, high-risk patients should be advised to call their provider promptly if they have symptoms of influenza. It may be useful for providers to implement phone triage lines to enable high-risk patients to discuss symptoms over the phone. To facilitate early initiation of treatment, when feasible, an antiviral prescription can be provided without testing and before an office visit. Information to assist clinicians about influenza testing decisions is available at https://www.cdc.gov/flu/professionals/diagnosis/consider-influenza-testing.htm. The most accurate influenza tests are molecular assays. Rapid molecular assays are available in clinical settings that can detect influenza virus nucleic acids in respiratory specimens in 15-30 minutes with high sensitivity and specificity. Other approved molecular assays can yield results in 60-80 minutes or in several hours with very high sensitivity and specificity. For hospitalized patients with suspected influenza, molecular assays are recommended. Information on influenza molecular assays is available at https://www.cdc.gov/flu/professionals/diagnosis/molecular-assays.htm. Rapid influenza diagnostic tests (RIDTs) with an analyzer device can detect influenza A and B viral nucleoprotein antigens in respiratory specimens in 10-15 minutes with moderate sensitivity, and RIDTs without an analyzer device have low to moderate sensitivity compared with reverse transcription-polymerase chain reaction (RT-PCR). Proper interpretation of influenza testing results is important to guide optimal management of influenza patients. An algorithm to assist clinicians in interpreting the results of influenza testing when influenza viruses ARE circulating in the community is available at https://www.cdc.gov/flu/professionals/diagnosis/algorithm-results-circulating.htm. Clinicians should be aware that a negative RIDT result does not exclude a diagnosis of influenza in a patient with suspected influenza when there is influenza activity in the community. Other factors such as the quality of the specimen, the source of the specimen in the respiratory tract, and the timing of specimen collection in relationship to illness onset, may also affect test results. Administration (FDA) and are recommended for use in the U.S. during the 2017–2018 influenza season: oseltamivir (available as a generic version or under the trade name Tamiflu®), zanamivir (Relenza®), and peramivir (Rapivab®). Oral oseltamivir is FDA-approved for treatment of uncomplicated influenza within 2 days of illness onset in persons aged 2 weeks and older, and for chemoprophylaxis to prevent influenza in people 1 year of age and older. Although not part of the FDA-approved indications, use of oral oseltamivir for treatment of influenza in infants younger than 14 days old, and for chemoprophylaxis in infants 3 months to 1 year of age, is recommended by CDC and the American Academy of Pediatrics. Due to limited data, use of oseltamivir for chemoprophylaxis is not recommended in children younger than 3 months unless the situation is judged critical. CDC recommends oseltamivir treatment as soon as possible for hospitalized patients with suspected or confirmed influenza, high-risk outpatients with suspected or confirmed influenza, and those with progressive disease. Inhaled zanamivir is FDA-approved for treatment of uncomplicated influenza within 2 days of illness onset in persons 7 years and older and for prevention of influenza in persons 5 years and older. Inhaled zanamivir is not recommended for treatment of influenza in hospitalized patients due to limited data. Intravenous peramivir is FDA-approved for the treatment of acute uncomplicated influenza within 2 days of illness onset in persons aged 2 years and older. Adamantanes (rimantadine and amantadine) are not currently recommended for antiviral treatment or chemoprophylaxis of influenza A because of high levels of resistance among circulating influenza A viruses. There are no current national shortages of neuraminidase inhibitors (i.e., oseltamivir, zanamivir and peramivir), and manufacturers report they expect to meet projected seasonal demands. If there is difficulty locating oseltamivir for oral suspension, as there has been in some previous seasons, oral suspension can be compounded by a pharmacy from oseltamivir capsules. However, this compounded suspension should not be used for convenience or when oseltamivir oral suspension is commercially available. Bacterial Infections: Antibiotics are not effective against influenza virus infection, and early diagnosis of influenza can reduce the inappropriate use of antibiotics if bacterial co-infection is not suspected. However, because certain bacterial infections can produce symptoms similar to influenza and bacterial infections can occur as a complication of influenza, bacterial infections should be considered and appropriately treated, if suspected. In addition, because pneumococcal infections are a serious complication of influenza infection, current pneumococcal vaccine recommendations for adults 65 years of age or older, as well as adults and children at increased risk for invasive pneumococcal disease due to chronic underlying medical conditions, should be followed (see http://www.cdc.gov/vaccines/vpd-vac/pneumo/vac-PCV13-adults.htm and http://www.cdc.gov/vaccines/vpd-vac/pneumo/vacc-in-short.htm for further information). Adverse Events and Antiviral Use: The most common adverse events associated with oral oseltamivir include a slightly increased risk of nausea and vomiting as compared to placebo, with nausea occurring in 10% of adults with influenza who received oseltamivir and 6% of people who received placebo in controlled clinical trials (3% and 4%, respectively, in children), and vomiting occurring in 9% of adults with influenza who received oseltamivir and 3% of people who received placebo in controlled clinical trials (15% and 9%, respectively, in children). These symptoms are generally transient and can be mitigated if oseltamivir is taken with food. Adverse events for inhaled zanamivir were not increased as compared to placebo in clinical trials, but cases of bronchospasm have been reported during post marketing; inhaled zanamivir is not recommended for persons with underlying airways disease (e.g., asthma or chronic obstructive pulmonary diseases). For people who received peramivir intravenously or intramuscularly in clinical trials, the most common adverse event was diarrhea, occurring in 8% versus 7% in people who received placebo. Results from unpublished CDC qualitative research shows that most people interviewed were not aware that drugs to treat influenza illness are available. A fact sheet for patients is available at http://www.cdc.gov/flu/antivirals/whatyoushould.htm. 1 Dobson J, Whitley RJ, Pocock S, Monto AS. Oseltamivir treatment for influenza in adults: a meta-analysis of randomised controlled trials. Lancet. 2015 May 2;385(9979):1729-37. 3 Hsu J, Santesso N, Mustafa R, Brozek J, Chen YL, Hopkins JP, Cheung A, Hovhannisyan G, Ivanova L, Flottorp SA, Saeterdal I, Wong AD, Uyeki TM, Akl EA, Alonso-Coello P, Smaill F, Schūnemann HJ. Antivirals for treatment of influenza: a systematic review and meta-analysis of observational studies. Ann Intern Med. 2012 Apr 3;156(7):512-24. 4 Doll MK, Winters N, Boikos C, Kraicer-Melamed H, Gore G, Quach C. Safety and effectiveness of neuraminidase inhibitors for influenza treatment, prophylaxis, and outbreak control: a systematic review of systematic reviews and/or meta-analyses. J Antimicrob Chemother. 2017 Nov 1;72(11):2990-3007. 5 Venkatesan S, Myles PR, Leonardi-Bee J, Muthuri SG, Al Masri M, Andrews N, Bantar C, Dubnoy-Raz G, Gérardin P, Koay ESC, Loh TP, Memish Z, Miller E, Oliva ME, Rath BA, Schweiger B, Tanq JW, Tran D, Vidmar T, Waight PA, Nguyen-Van-Tam JS. Impact of Outpatient Neuraminidase Inhibitor Treatment in Patients Infected With Influenza A(H1N1)pdm09 at High Risk of Hospitalization: An Individual Participant Data Metaanalysis. Clin Infect Dis. 2017 May 15;64(10):1328-1334. 6 Muthuri SG, Venkatesan S, Myles PR, Leonardi-Bee J, Al Khuwaitir TS, Al Mamun A, Anovadiya AP, Azziz-Baumgartner E, Báez C, Bassetti M, Beovic B, Bertisch B, Bonmarin I, Booy R, Borja-Aburto VH, Burgmann H, Cao B, Carratala J, Denholm JT, Dominguez SR, Duarte PA, Dubnov-Raz G, Echavarria M, Fanella S, Gao Z, Gérardin P, Giannella M, Gubbels S, Herberg J, Iglesias AL, Hoger PH, Hu X, Islam QT, Jiménez MF, Kandeel A, Keijzers G, Khalili H, Knight M, Kudo K, Kusznierz G, Kuzman I, Kwan AM, Amine IL, Langenegger E, Lankarani KB, Leo YS, Linko R, Liu P, Madanat F, Mayo-Montero E, McGeer A, Memish Z, Metan G, Mickiene A, Mikić D, Mohn KG, Moradi A, Nymadawa P, Oliva ME, Ozkan M, Parekh D, Paul M, Polack FP, Rath BA, Rodríguez AH, Sarrouf EB, Seale AC, Sertogullarindan B, Siqueira MM, Skręt-Magierło J, Stephan F, Talarek E, Tang JW, To KK, Torres A, Törün SH, Tran D, Uyeki TM, Van Zwol A, Vaudry W, Vidmar T, Yokota RT, Zarogoulidis P; PRIDE Consortium Investigators, Nguyen-Van-Tam JS.. Effectiveness of neuraminidase inhibitors in reducing mortality in patients admitted to hospital with influenza A H1N1pdm09 virus infection: a meta-analysis of individual participant data. Lancet Respir Med. 2014 May;2(5):395-404. 7 Fry AM, Goswami D, Nahar K, Sharmin AT, Rahman M, Gubareva L, Azim T, Bresee J, Luby SP, Brooks WA. Efficacy of oseltamivir treatment started within 5 days of symptom onset to reduce influenza illness duration and virus shedding in an urban setting in Bangladesh: a randomised placebo-controlled trial. Lancet Infect Dis. 2014 Feb;14(2):109-18. CDC: During week 51 (December 17-23, 2017), influenza activity increased sharply in the United States. Viral Surveillance: The most frequently identified influenza virus subtype reported by public health laboratories during week 51 was influenza A(H3). The percentage of respiratory specimens testing positive for influenza in clinical laboratories increased. Influenza-associated Hospitalizations: A cumulative rate of 8.7 laboratory-confirmed influenza-associated hospitalizations per 100,000 population was reported. Outpatient Illness Surveillance:The proportion of outpatient visits for influenza-like illness (ILI) was 5.0%, which is above the national baseline of 2.2%. All 10 regions reported ILI at or above region-specific baseline levels. Twenty-one states experienced high ILI activity; New York City and five states experienced moderate ILI activity; eight states experienced low ILI activity; 14 states experienced minimal ILI activity; and the District of Columbia, Puerto Rico and two states had insufficient data. Geographic Spread of Influenza:The geographic spread of influenza in 36 states was reported as widespread; Puerto Rico and 13 states reported regional activity; one state reported local activity; and the District of Columbia, the U.S. Virgin Islands, and Guam did not report. La Niña is the cooler sister to El Niño. La Niña draws cool water up from the depths of the eastern Pacific, energizes the easterly winds, and pushes warm surface water back toward Asia. 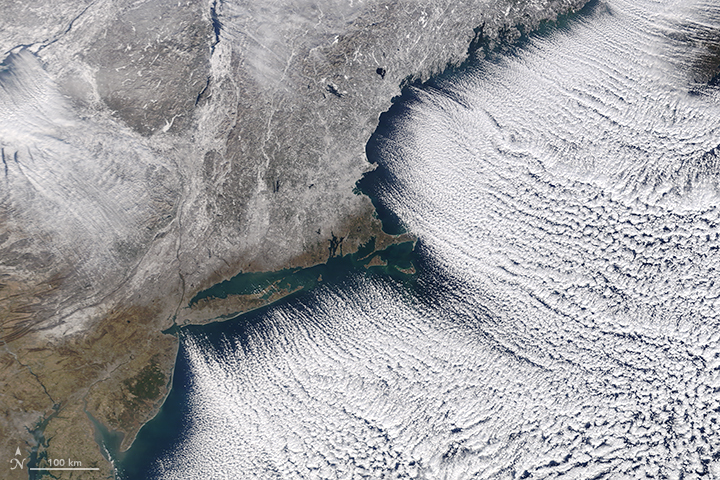 (Note the ripples of warm water moving west across the equator.) In turn, global atmospheric circulation and jet streams shift with the changing heat and moisture supply from the vast Pacific Ocean. During La Niña events, the weather tends to grow warmer and drier across the southern portion of North America, from California to Florida. Cooler than normal temperatures usually prevail across western Canada, Alaska, and the U.S. Pacific Northwest. Over the central and eastern Pacific Ocean, clouds and rainfall become more sporadic, while rainfall tends to increase dramatically in Indonesia and the western Pacific. Weather conditions in late 2017 seemed to fit with that pattern. Puerto Rico: More than 1.5 million people on the island are still in the dark. After Hurricane Maria tore across Puerto Rico, it quickly became clear that the destruction would pose daunting challenges for first responders. Most of the electric power grid and telecommunications network was knocked offline. Flooding, downed trees, and toppled power lines made many roads impassable. In circumstances like this, quickly knowing where the power is out—and how long it has been out—allows first responders to better deploy rescue and repair crews and to distribute life-saving supplies. 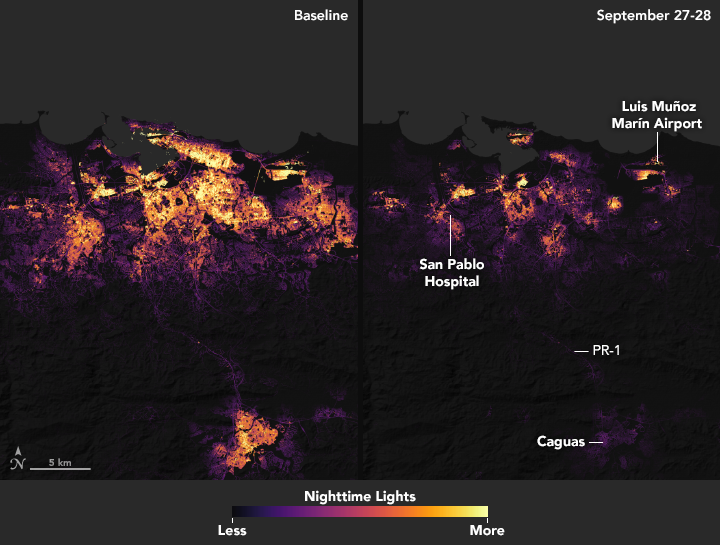 And that is exactly why teams of scientists at NASA are working long days to make sure that groups like the National Guard and the Federal Emergency Management Agency (FEMA) get high-quality satellite maps of power outages in Puerto Rico. The images above show lighting around San Juan, capital of the commonwealth; the images below show the entire island. One image in each pair shows a typical night before Maria made landfall, based upon cloud-free and low moonlight conditions; the second image is a composite that shows light detected by VIIRS on the nights of September 27 and 28, 2017. 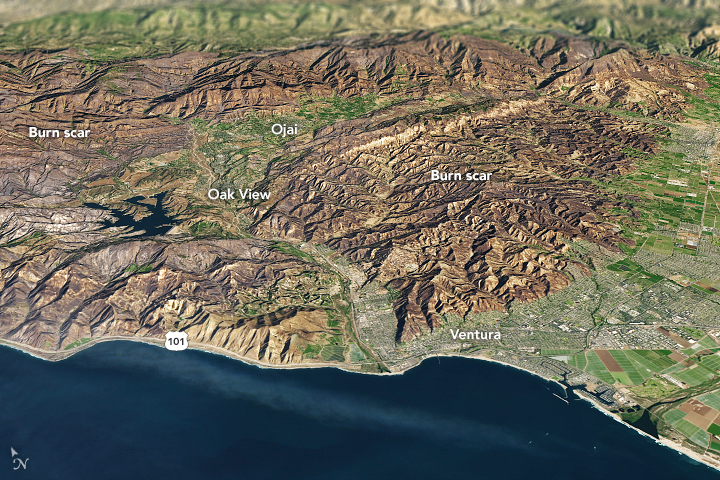 By compositing two nights, the image has fewer clouds blocking the view. 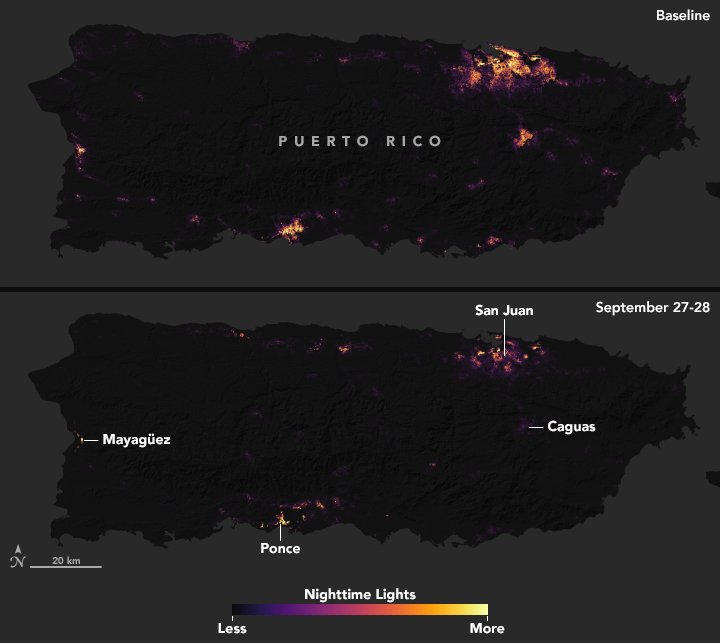 (Note: some clouds still blocked light emissions during the two nights, especially across southeastern and western Puerto Rico.) The images above show widespread outages around San Juan, including key hospital and transportation infrastructure. “……No group has claimed the attack, but experts believe it is the work of the Islamic State. At least 14 died and 16 were injured when a fire engulfed an upscale rooftop restaurant in central Mumbai.